The Wilton Public School project is one of the first DEC projects to adopt and interpret the new objectives and DEC Educational Principles. These principles seek to promote the design of collaborative learning and teaching environments, which embrace the principles of next generation learning. 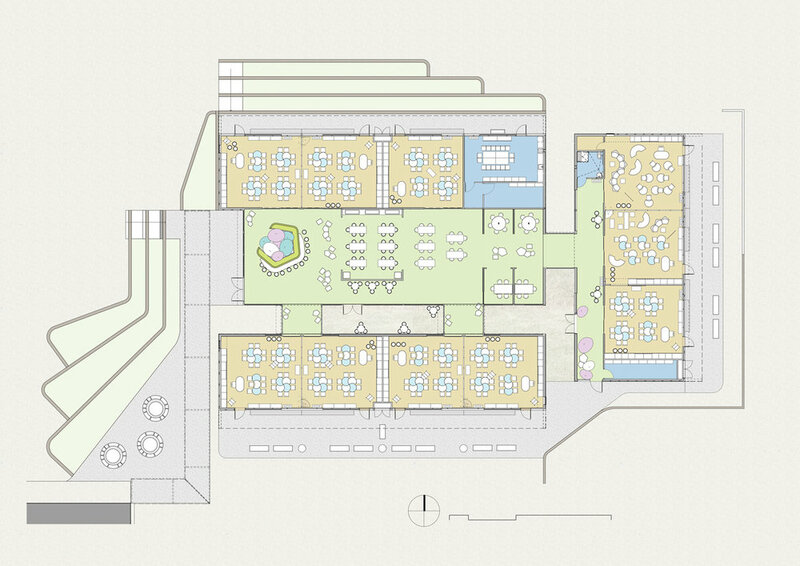 The design strategy for the project involved organising the Homebases (classrooms) around a large central communal space, which would become the social focus for students and teachers. Elements such as art benches and withdrawal spaces traditionally located within individual Homebases were relocated into the new central area. The Communal space was organised around three zones: a social touchdown space; an interactive creative zone and a Huddle Zone for more reflective activities. In addition to each of the Homebases opening into the central collaborative area they also opened onto landscaped external space configured for outdoor learning. The principle of extending the learning environment into the landscape was further reinforced by the central collaborative area which opened into a landscaped amphitheatre creating an outdoor social academic focus for small school gatherings events and performances.